Psypoke - View topic - What food do you buy to get your pokemon happy? What food do you buy to get your pokemon happy? What food do you buy pokemon to make them happy? The Hypnose will put you to sleep. Vitamins - (like Protein and Iron) and you can give it a haircut In the Goldenrod Underground. Why don't you have a look on Psypoke. Food. um Vitamins like scizor slash and super potions etc. Whenever I need to add extra HP to my pokemon in batter, I give it Lemonade, it also raises it happiness a little at the same time. "If you want to stab someone in the back, you first need to get behind them." Most of the time I use HP Ups, but I'm not sure if it can be considered as food. I use Lemonade most of the time too, since it's so cheap. 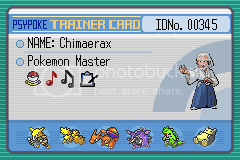 Alex, the greatest Pokemon trainer! Gold and Silver are the best Pokemon games ever!!! no...plz read the happinness guide in psypoke before posting. Okay, so who didn't read the happiness guide on PsyPoke this time? -Trading/Change of Ownership resets happiness. And to answer the question, Rage Candybar and the various soft drinks don't affect happiness. Only the vitamins (Protein, Carbos, Iron, Calcium, HP Up, PP Up, and in RSEFRLG, Zinc) raise the value. sry for the mistake if im wrong and it wasnt in the guide. however, ive found the reason why i was under the impression ragecandybar lowers happiness. "Heals 20 HP and lowers happiness"
sry for the confusion and hope noone was offended or anything...but if the item guide is mistaken could someone plz correct it? So... If ragecandybar lowers happiness, then I am getting rid of them. 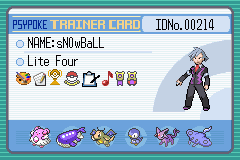 I use Lemonades on my pokemon to make them happy, and for and 's sake, i will use a friend ball (give a green apricorn to Kurt, the Pokeball maker) so that they will evolve into and faster! Last edited by Blaziken386 on Mon Mar 28, 2005 7:27 pm, edited 2 times in total. once I had a that had just gained a level, but had lost a lot of HP, and went to the lady in Goldenrod City, and she said that was happy, but it was not ready to evolve yet, so then I fed a lemonade, then I talked to the lady again, and she said that really trusted me, so I raised it up another level and I had a ! P. S. I didn't do anything in between the battle that had hurt my , and talking to the lady the first time! Last edited by Blaziken386 on Mon Mar 28, 2005 7:27 pm, edited 1 time in total. We discovered battleing doesn't affect anything. So this wouldn't matter. ~For proof, check out the Hapiness Guide writen by Frost on the main site! Getting poisoned or paralysed, or basically any status lowers happiness, doesn't it? So battling does affect happiness, in an indirect sort of way.